She was a member of the House of Bourbon. Carlos Domingo de Borbón was born on 5 March 1780. He was the son of Carlos IV, Rey de España and Maria Luisa di Borbone, Principessa di Parma. He died on 11 June 1783 at age 3. Maria Luisa de Borbón was born on 11 September 1777 at San Ildefonso, SpainG. She was the daughter of Carlos IV, Rey de España and Maria Luisa di Borbone, Principessa di Parma. She died on 2 July 1782 at age 4 at El Escorial Palace, Madrid, SpainG. Felipe Francesco de Borbón was born on 5 September 1783. He was the son of Carlos IV, Rey de España and Maria Luisa di Borbone, Principessa di Parma. He died on 18 October 1784 at age 1. He was a member of the House of Bourbon. Carlos Maria de Borbón, Duques de Molina was born on 29 March 1788. He was the son of Carlos IV, Rey de España and Maria Luisa di Borbone, Principessa di Parma. He married, firstly, Maria Francesca de Bragança, Infanta de Portugal, daughter of Dom João VI de Bragança, Rei de Portugal e Brasil and Carlota Joaquina de Borbón, Infanta de España, on 22 September 1816 at Madrid, SpainG. He married, secondly, Maria Teresa de Bragança, Infanta de Portugal, daughter of Dom João VI de Bragança, Rei de Portugal e Brasil and Carlota Joaquina de Borbón, Infanta de España, on 20 October 1838 at AzcoitiaG. He died on 10 March 1855 at age 66 at Trieste, ItalyG. He was a member of the House of Bourbon. He gained the title of Infante de España. He gained the title of Duques de Molina. She gained the title of Infanta de España. [S1404] Carlos González-Conde y Llopis, "re: González-Conde y Llopis Family," e-mail message to Darryl Lundy, 23 July 2005. Hereinafter cited as "re: González-Conde y Llopis Family." [S16] Louda and MacLagan, Lines of Succession, table 126. 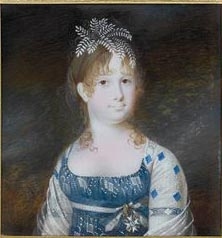 Marie Therese de Borbón was born on 16 February 1791. She was the daughter of Carlos IV, Rey de España and Maria Luisa di Borbone, Principessa di Parma. 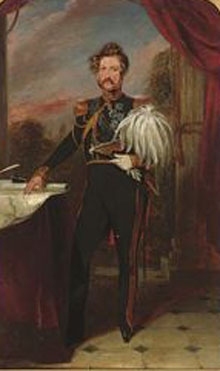 Felipe de Borbón was born on 28 March 1792. He was the son of Carlos IV, Rey de España and Maria Luisa di Borbone, Principessa di Parma. He gained the title of Infante de España. He gained the title of Duque de Cádiz. [S16] Louda and MacLagan, Lines of Succession, table 52.